Bernie Sanders speaks during a campaign rally at the Sondheim Center on Thursday in Fairfield, Iowa. If you’re dreaming of Bernie Sanders beating Hillary Clinton, you know how the movie begins (he wins Iowa on Monday1), how it ends (he accepts the nomination to a Simon & Garfunkel tune), and one of the major plot lines (black, Hispanic and moderate Democrats, who for now prefer Clinton to Sanders, begin to #feelthebern). You also know who the hapless villain is: Democratic party elites (aka “the establishment”), who will be fighting Sanders every step of the way. Sanders is highly competitive in the first two states, Iowa (where he’s only narrowly behind Clinton) and New Hampshire (where he leads her). However, those states are favorable for Sanders demographically, with Democratic turnout dominated by Sanders’s base of white liberal voters. The question is whether Sanders can expand his coalition into more diverse states that will vote later on and where African-Americans, Hispanics and white moderates make up a larger share of the electorate. He won’t need to win every voter in these groups, but he’ll need enough of them to go from the roughly one-third of Democratic voters he captures in national polls now to the 50-percent-plus he’ll need eventually. The first challenge for Sanders is that he appears to be trailing in Iowa. Our “polls-only” forecast gives Clinton a 68 percent chance of winning the state, compared with 32 percent for Sanders, on the basis of her being about 4 percentage points ahead in our weighted polling average. Our “polls-plus” forecast, which assigns some additional credit to Clinton because of her massive lead in endorsements, has Clinton as a 76 percent favorite. To be clear, those forecasts aren’t predicting that Clinton will win Iowa by 30 percentage points. They’re projecting a close finish and saying that Clinton is somewhat more likely — a little better than a 2-to-1 favorite — to come out on top. But Iowa polls are not all that accurate, and even some polls that show Clinton ahead envision Sanders winning if his voters come out. A Sanders win wouldn’t be all that much of an upset, in other words, at least relative to where the polls stand now. At the same time, it’s not clear that Sanders has momentum in the Hawkeye State. He made major gains when the first few polls came out in January relative to where they’d been in December, making the race much closer. But he’s never quite surpassed Clinton. In fact, Clinton’s had roughly the same 4-point lead in our polling average for a couple of weeks now. We’ll know more after the Des Moines Register, which previously had Clinton 2 points ahead, releases its excellent poll Saturday. What if Sanders wins Iowa? No candidate has won the the nomination without winning either Iowa or New Hampshire since Bill Clinton in 1992. But there are two reasons to think that Hillary Clinton, like her husband, could defy the prevailing trend. One is the issue I mentioned earlier: Sanders’s success in Iowa and New Hampshire might be a reflection of their Sanders-friendly demographics rather than a harbinger of Clinton’s doom. That seems to match the polling we’re seeing in other states, where (for instance) Sanders is doing relatively well in Wisconsin, which also has plenty of white liberals, but struggling in North Carolina, which has fewer. Unlike on the Republican side, this isn’t necessarily a choice between head and heart for Democratic voters. Democrats aren’t just backing Clinton because they think she’s more pragmatic or electable; most of them are closer to Clinton than Sanders on the issues. So even if Sanders gained a lot of momentum after the early states, he could have trouble closing the sale with voters who think he’s a little too far to the left. The other factor is that Clinton has the Democratic machine more or less fully behind her. What influence “the party” exerts over voters is a matter of considerable debate and importance, but empirically, endorsements have continued to hold predictive power throughout the nomination process and not just in Iowa and New Hampshire. Clinton also begins with a large edge in superdelegates, who make up about 15 percent of delegates to the Democratic convention. Those superdelegates could switch to Sanders if it looked like he had a mandate from Democratic voters, but they’d probably tip the balance to Clinton in a too-close-to-call race. Furthermore, although it’s true that no candidate since Bill Clinton has won the nomination without winning one of the first two states, that may be because the establishment has always had an acceptable candidate to choose from. In 1992, when party leaders were lukewarm on both Iowa winner Tom Harkin and New Hampshire winner Paul Tsongas, somehow the rules were bent, Clinton was billed as the “comeback kid” despite losing each of the first four states,3 and he went on to win the nomination fairly easily. But Sanders would have an avalanche of momentum going for him after wins in Iowa and New Hampshire. The national press corps, which spins even minor stories into crises for Clinton, would portray Clinton’s campaign as being in a meltdown. Momentum usually matters in the primaries — and sometimes it matters a lot — but exactly how many Democrats would change their votes as a result is hard to say. The wave of negative coverage might be especially bad for Clinton, but it’s also possible that, because the media has sounded false alarms on Clinton before, she’d be relatively immune to the effects of another round of bad press. One factor helping Sanders: Voters who had been attracted to his message before, but who weren’t sure he could win, would mostly have their doubts removed after he beat Clinton twice. It’s also possible that Democratic party elites would panic. A good indicator for this will be whether there would be renewed efforts to draft Joe Biden, or some other candidate, such as John Kerry, into the race. That would probably constitute a misreading of the situation. Sanders’s support reflects support for Sanders more than it does an anti-Clinton vote, whereas there’s never been much of a market for Biden. The more calls you hear to “draft Biden,” the more likely it is that Clinton’s support will be undercut when it’s far too late for party elites to come up with a viable alternative and that Sanders wins the nomination. The first chance we’d have to get a read on the situation would be Nevada, which votes Feb. 20. (Nevada comes before South Carolina for Democrats; the reverse is true for Republicans.) Nevada’s one of the hardest states to forecast, however: There’s not a lot of polling there, and I’m not sure I’d trust the polls anyway in a low-turnout caucus. Jon Ralston, the uncannily accurate Nevada journalist, gives Clinton a “slight edge” in the state. That sounds about right. Clinton has a strong ground game in Nevada and could perform well among Hispanics. Sanders has advertised heavily in Nevada, and voter enthusiasm could be important in the state, especially if he won support from Nevada’s heavily unionized workforce. One state that doesn’t look good for Sanders is South Carolina, where Clinton is ahead by 31 points and where the Democratic electorate is majority black and relatively conservative. If Sanders wins there, or comes within a few points of doing so, that will be an unambiguous sign that Clinton is in deep trouble. If Clinton’s firewall holds in South Carolina, however, she also figures to perform well in the “SEC Primary” states of March 1, at which point she’d potentially build up a fairly large delegate lead and tamp down some of the panicky media coverage. What if Sanders loses Iowa? It’s probably over. Not that I’d expect Sanders to drop out of the race. Nor would I expect the media to stop covering it. Depending on Clinton’s margin of victory, you’d probably see some headlines about her resilience, but others saying the results had “raised doubts” about her campaign. None of that would necessarily matter. 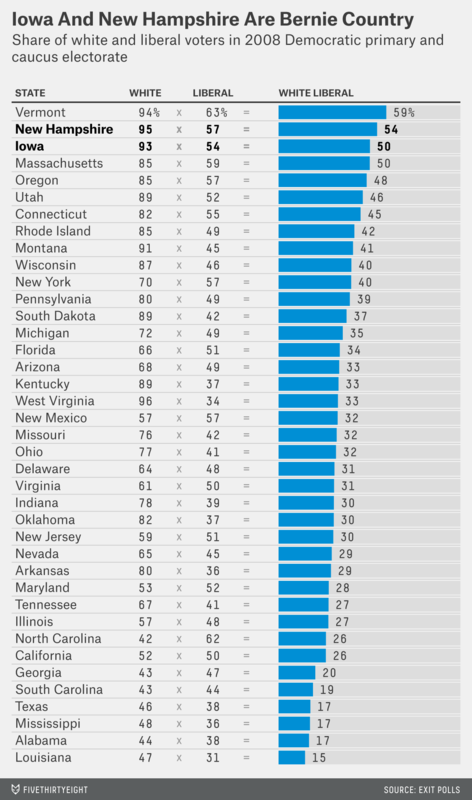 Iowa should be one of the half-dozen or so most favorable states in the country for Sanders; New Hampshire is one of the few that ranks even higher for him. If Sanders can’t win Iowa, he probably won’t be winning other relatively favorable states like Wisconsin, much less more challenging ones like Ohio and Florida. His ceiling wouldn’t be high enough to win the nomination unless something major4 changes. For the reasons I’ll explain, winning only New Hampshire eight days later probably wouldn’t be enough. Technically, Muskie tied for first with “uncommitted” in Iowa. Clinton also lost Maine and South Dakota before notching some victories on Super Tuesday. Such as a federal indictment of Clinton.